On-chip glass cylinders with diameters around 50 microns which are capable of storing light played a key role in the study. The scientists could show that the optical near-field, that is the light-field that is leaking out of the glass cylinders, can be used as actuator and sensitive probe for nanomechanical oscillators. This enables measurements that are only limited by the fundamental quantum fluctuations of light. Thereby, the novel technique for the first time allows the measurement of sensitivities at the level of the quantum mechanical zero-point fluctuations of the nano-oscillators which is of great interest for fundamental research. Applications such as single-atom or single-charge detection by atomic or magnetic force microscopy may also benefit from the extremely low-noise method with a noise background at the level of the standard quantum-limit. Nanomechanical oscillators are ideal candidates for studying the quantum limits of mechanical motion in an experimental setting. Moreover, they are the basis for a variety of precision measurements. Significant attention has been devoted to developing sensitive readout techniques for motion over the past decade. Optical methods have thereby achieved the best results. However, these have been limited to objects which are larger than the wavelength. Techniques based on electron flow which are applicable to nanoscale objects have so far reached only limited precision. The MPQ and LMU physicists have now for the first time achieved quantum limited measurements of nanomechanical oscillators by applying a novel optical method. Optical techniques have so far suffered from the fact that diffraction losses occur as soon as sub-wavelength objects are being looked at. In the present experiment this problem is bypassed by using optical near-fields. A key element is a cylindrical resonator made out of glass with a diameter of approximately 50 microns. The microtoroid can store light if it exhibits the right wavelength, that is, if the toroid’s optical circumference is an integer multiple of the wavelength. 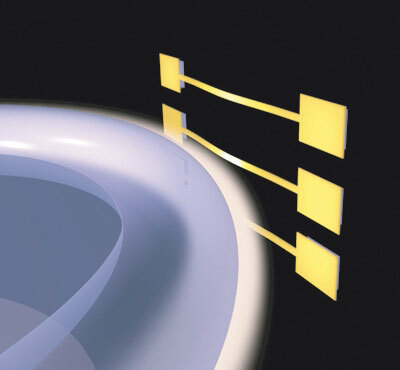 A small portion of the stored light, however, the so-called optical near-field, leaks out of the resonator and can be used as a probe for the nanomechanical oscillators (see Figure). These are strained silicon nitride strings which have typical cross-sections of 100 by 500 nanometres and are 15-40 microns long (tht nanostrings and microtoroids were fabricated in the clean rooms of Jörg Kotthaus at LMU and at the Eidgenössischen Technischen Hochschule Lausanne). If the nanostrings are brought in close proximity to the toroid, that is into its near-field which extends a few hundred nanometres from its surface, both can interact with each other. The nanostrings act thereby as a dielectric and locally change the refractive index seen by the light field. This leads to a change of the toroid’s optical circumference and thus of the toroid’s resonance frequency. The optical resonance frequency shift caused by a single nanostring is so large that even its Brownian motion has a strong and easily measureable influence. This allows highly-sensitive measurements of the strings’ motion. The sensitivity to changes in the distance between string and toroid is thereby as small as the quantum-mechanical zero-point fluctuations of the nanostring which are expected at absolute zero temperature and equal to the standard quantum-limit. Besides the high sensitivity to the motion of nanoscale objects there is another important aspect of the work, Georg Anetsberger, PhD student in Tobias Kippenberg’s group, emphasizes. Equally important is the first experimental demonstration that also nanoscale objects can directly be manipulated by radiation pressure, e.g. cooled down or driven into oscillation. "We can observe that the dipole force of the optical near-field leads to dynamical back action which can drive the nanostrings into coherent, laser-like oscillations." The employed method can in principle be applied to all dielectric nanomechanical oscillators which could further foster their use as ultra-sensitive sensors. Once more, Tobias Kippenberg says, the versatility of microtoroids which have been the focus of his research for a few years now becomes evident. "We have developed an experimental platform which could greatly broaden the possible applications of nanomechanical oscillators. Moreover it constitutes an interface which allows the interaction of photons and phonons in such a way that quantum mechanical effects could become measureable even at room temperature."